This 5-year programme offers students the academic training and human development required to work as infant (0 - 6 years) and primary (6 - 12 years) school teachers. You can obtain two Official Education Degrees in just 5 years. You will be qualified to work in infant (0 - 6 years) and primary (6 - 12 years) schools. You will broaden your options in the job market and gain access to more schools. You can study one of the degrees full-time (face-to-face) and the other remotely (blended learning). The Double Education Degree can be taken in Spanish or Spanish/English (bilingual group). You can obtain specialisation qualifications in each degree, as well as the Ecclesiastical Declaration of Academic Competence certificate (DECA). What does this Double Education Degree offer? During this five-year double degree programme, students acquire resources and strategies to facilitate children’s autonomy and ability to communicate and express themselves. Students also learn how to help children understand the world around them through observation, artisitc expression, music, language, literature, history, and sport. At CUCC, we provide the kind of friendly and supportive learning environment that we hope our students will emulate in the future to foster the development and growth of their pupils. To become good teachers, we believe that our students require a combination of theory and practice. For this reason, our degree programmes place importance on real classroom contact. In the 2nd, 3rd and 4th years, you will obtain first-hand experience working in schools alongside tutors, teachers and directors. Most importantly, you will help to organise and carry out activities with children and engage in their learning process. To contribute to children’s development and growth, while considering their family and socio-cultural context. To teach children to observe the world around them, ask questions, and interpret reality with the help of adults. To awaken children’s interest in language, mathematics, music, nature, and sport, through games and activities. To create a welcoming environment inside and outside the classroom to facilitate children’s growth and learning. To enhance children’s ability to express themselves and communicate with each other and with adults, based on listening and respect. To promote respect for fundamental rights and gender equality. To promote respect, human rights, and the principles of universal accessibility and design for all in accordance with Provision 10 of Law 51/2003, of 2 December, on equal opportunities, non-discrimination and universal accessibility for persons with disabilities. To promote the values inherent in a culture of peace and democracy. To acquire and understand the subject matter presented in different areas of study of the degree to work as a qualified infant education teacher. To know how to apply this knowledge in a professional manner, demonstrating mastery of skills to construct and defend arguments and resolve problems in different areas of study. To be able to collect and interpret relevant data from different areas of study and express informed opinions related to socio-educational, scientific and ethical topics. To be able to transmit information, ideas, problems, and solutions to specialised staff involved directly and indirectly their education. To acquire the necessary learning skills to further their education independently. Public, state-subsidised, and private schools with children aged 6 to 12 years old. Nurseries and private schools with children aged 0 to 3 years old. Other centres outside the school context, such as education programmes for children aged 6 to 12 years old in hospitals, prisons, and other organisations. Institutions that offer education projects, such as museums, play centres, arts and sports clubs, theatres, etc. Education-related sectors, such as the creation of teaching materials, textbooks and computer programs. To teach religion in primary education schools (public, private and state-subsidised), students must hold the Ecclesiastical Declaration of Academic Competence (DECA) certificate. CUCC students can take the DECA course as part of their degree programme. Master's degrees offer an advanced level of training based on academic and professional specialisation and research. PhD programmes provide graduates with advanced research training. The duration of PhD programmes is not based on credits. They involve a period of training and a period of research (PhD thesis). Specialisation and continuing education courses. Base degree programme (face-to-face). Second degree programme (blended learning). CUCC offers the possibility to study two Official Education Degrees in five years. Graduates of the Double Education Degree are qualified to work as teachers of Infant Education (0 - 6 years) and Primary Education (6-12 years). Applicants must complete pre-enrolment and enrolment for the first degree in accordance with the entrance requirements of the University of Alcalá for both degree programmes. After enrolling, applicants must notify the CUCC Secretary in person that they wish to study the double degree. Double degree students also have the option to take a specialisation course in each degree and/or obtain the Ecclesiastical Declaration of Academic Competence (DECA) certificate. You must remember to enrol for the credits required to take the two specialisation courses. From the 1st to the 4th year, students enrol in subjects from the Infant Education degree, as well as one or two subjects from the Primary Education programme. At the end of the first year, your academic performance will be reviewed to assess whether you can continue the Double Education Degree. You must obtain all the ECTS credits for the Infant and Primary Education programmes. After completing the first four years, you will obtain a Degree in Infant Education. At the end of the 5th year, you will receive a Degree in Primary Education. The Infant Education degree subjects are taken as face-to-face classes (morning timetable). Meanwhile, the Primary Education subjects will be studied through blending learning. In the 5th year, double degree students get a 20% discount off private tuition fees. 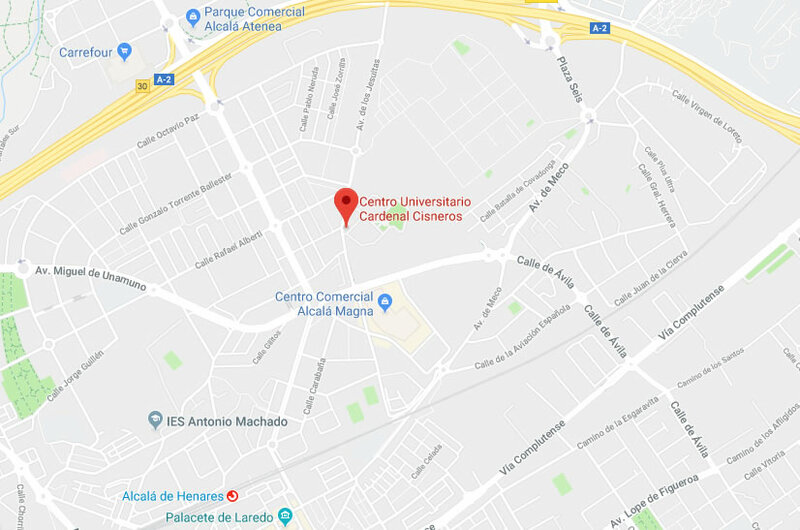 As you progress through the double degree, you are required to pay public fees for the credits of the Primary Education degree (25% of the credit price) to the University of Alcalá. From the 1st to the 4th year, students enrol in subjects from the Primary Education degree, as well as one or two subjects from the Infant Education programme. At the end of the first year, your academic performance will be reviewed to assess whether you can continue the Double Education Degree. You must obtain all the ECTS credits for the Primary and Infant Education programmes. After completing the first four years, you will obtain a Degree in Primary Education. At the end of the 5th year, you will receive a Degree in Infant Education. The Primary Education degree subjects are taken as face-to-face classes (morning timetable). Meanwhile, the Infant Education subjects will be studied through blending learning. Effective teachers in bilingual contexts must have a strong command of English and teaching knowledge. At CUCC, we implement the CLIL approach (Content and Language Integrated Learning) in our education degree programmes. Students gain first-hand experience and extensive practice with CLIL so that they can implement this approach as teachers in their future classrooms. The number of subjects taken in English increases from the 1st to the 4th year. In total, 50% of the degree programme is taught in English. Students can take teaching internships in schools located in Spain and overseas, including England, Ireland, Finland, USA, Nepal, and Australia. This practical training period will enhance your academic and professional opportunities in Europe. Our bilingual programmes are compatible with any of our specialisation courses: Foreign Language, Physical Education, Special Educational Needs, and Artistic Expression. You can also opt to take the DECA course (Ecclesiastical Declaration of Academic Competence). The Bilingual Project is formed by professors specialising in different areas of knowledge. The entire team has received extensive CLIL training. Also, additional language support is provided in classes by native English-speaking language assistants. In 2014, our bilingual programme received the European Language Label from the Ministry of Education, Culture and Sport through the Spanish Service for the Internationalisation of Education (SEPIE). The “European Language Label for Innovative Initiatives in Language Teaching and Learning" of the European Commission aims to promote language learning as a necessary vehicle for authentic European integration. This award recognises innovative experiences in the field of teaching and learning foreign, national or regional languages, and other actions carried out at the community level by citizens. If you would like to enrol for the Bilingual Infant Education Degree, after completing pre-enrolment, you need to demonstrate that you have at least a B1 English level. You can do this either by presenting an official English certificate or taking our English level test. For further information on how to access the Bilingual Infant Education Degree, please click here. We use an active and constructive methodology based on the principles of student-centred learning. This active and participatory approach involves planning and developing training actions that foster independent learning. Problem-Based Learning (PBL): PBL allows students to learn from real situations through analysis and joint reflection with other students, and the creation of specific actions. Cooperative learning: Strong teamwork skills are valued highly by students and employers. This learning model helps students to develop basic teamwork skills, work towards common goals, solve problems, and get the most out of cooperative learning. Dialogic talks: This teaching resource is based on reading books and joint reflection. It enables students to connect new and existing knowledge, discover new ideas, listen to others, and enrich their own perspectives with the opinions of others. Project-based learning and interdisciplinary activities: This methodology demonstrates that knowledge is not fragmented. Students learn to recognise the connections between different courses and subjects. This comprehensive perspective of learning is extremely useful for future teachers. CUCC’s teaching staff is formed by professionals committed to teaching, research, innovative projects, and social and environmental actions. Our teaching and learning model is based on maintaining a close and supportive relationship with students. At CUCC, we make students the protagonists of learning to foster their critical thinking, autonomy and personal growth. The 2nd, 3rd, and 4th years of the degree programme involve practical teaching internships in schools. You will have the opportunity to experience first-hand an infant education classroom, learn from teachers, and put your acquired knowledge and skills into practice. The practicum offers real contact with innovative, engaged, and open schools, providing meaningful and valuable experiences for your personal and professional future. Students can take internships in public, private and state-subsidised schools. The practicum coordinators will guide you through the entire process of choosing an internship at schools in the Community of Madrid and the province of Guadalajara, many of which are bilingual schools. Students can also apply to take internships in different autonomous communities or countries by contacting the Practicum Coordinators. The duration of the internship is calculated based on full school days, regardless of the timetable of each school. Each year, CUCC publishes a list of available internships. Students then apply to schools in order of preference. After the selection deadline, students are assigned internship placements in accordance with the regulations of the autonomous community, UAH, and CUCC. Practicum I. This subject is taken in the 2nd year and introduces students to the real school context. The aim is for students to learn how schools and classrooms work by observing and participating in class activities. We refer to this stage as participant observation. Practicum II. This subject is taken in the 3rd year. The aim is for students to engage in teaching children and participate in class activities. The students are supervised and guided by a class teacher at all times. We refer to this stage as guided intervention. Practicum III. This subject is taken in the 4th year. In this final internship, students have more independence and play an active role in classes with children. They have the chance to apply their expertise and resources in a real class environment. We refer to this stage as autonomous intervention. You can also complete your practicum as part of the Erasmus programme or other international student mobility programmes. If you are interested in doing so, please contact the Practicum and International Relations departments at CUCC. Previous training sessions: The aim of the prior training sessions is to facilitate reflection about teaching and to prepare students for their role during the internship. Simultaneous training sessions: These sessions are held during the internship period. The aim is to encourage students to reflect on what they have observed in classes and to suggest improvements together with their classmates and tutor. The CUCC tutor maintains contact with the students throughout the internship, while also monitoring their performance in the internship school and the previous and simultaneous sessions. External assessment by the school tutor. Internal assessment by the CUCC Practicum tutor. Self-assessment by the student regarding their performance. Telephone: 91 889 12 54 Ext. 116 & 117. Office hours: Monday to Friday: 9.00 a.m. - 3.00 p.m. The ability to analyse, pay attention, communicate and persuade. Creativity and the ability to engage in effective teaching proposals. The ability to think critically about reality and the teaching environment. Desire and enthusiasm to work in teams through respect, tolerance and cooperation. Higher Technician Diploma (FP II). Certificate from Foreign Education Systems. Students from previous legislation (LOE, LOGSE, COU, PREU or equivalent) and the PAU university entrance exam. People over the age of 25 years. People over the age of 40 years (with work experience). People over the age of 45 years.